Step 1 : Draw a line segment BC. Step 2 : Draw ∠CBX of measure equal to that of ∠B. Step 3 : Draw ∠BCY with Y on the same side of BC as X, such that its measure is equal to that of ∠C. 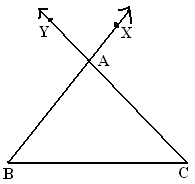 Let BX and CY intersect at A. Then, ΔABC is the required triangle. Construct a ΔABC in which BC = 6 cm, ∠B = 35 0 and ∠C = 100 0 . Step 1 : Draw a line segment BC = 6 cm. Step 4 : Let BX and CY intersect at A.
ΔABC is the required triangle. 1) If we have PQ = 5 cm, ∠PQR= 115° and ∠QRP = 30°, can we construct a ΔPQR with these measurements? 2) State true or false: In ΔABC, the side included between ∠B and ∠C is AB. 3) Construct ΔABC in which BC=6 cm, ∠B = 35 0 and ∠C = 100 0 . 4) In ΔABC, BC = CA. Which of its two angles are equal ? 5) If m∠A=70 0 ,AB= 5cm and m∠B=60 0 which rule is used here to construct triangle ABC?